When it comes to diagnosing children with autism spectrum disorder (ASD), earlier is better. The American Academy of Pediatrics recommends screening children for ASD between 1.5 – 2 years of age. However up until now, diagnosis of ASD has been driven by clinical observations, often behaviors not yet formed in children this young, and consequently most children are diagnosed around 4 or 5 years. Earlier diagnosis allows for specialized interventions that capitalize on the plasticity of toddler’s brains while implementing proven behavioral therapies like applied behavioral analysis and developmental relationship-based approaches to promote communication and social interaction. One of the challenges in diagnosing ASD is the variability in symptoms along the spectrum, and the change in developmental standards with age. 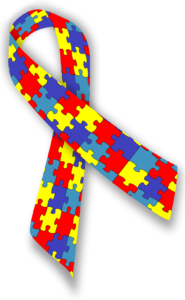 Some symptoms common to ASD are common to other disorders as well and therefore do not aid in diagnosis. With 1 in 59 children identified with ASD and median diagnosis age ranging from 3 to 5 years, research in the field has been two-pronged: characterizing the variability in the disorder and improving diagnostic tests. 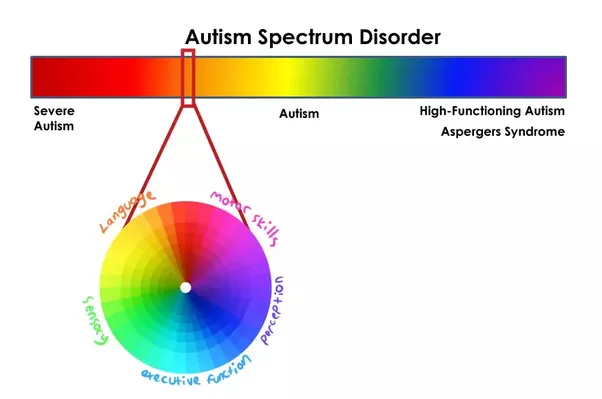 Depiction of ASD aspects at each part of the spectrum (image courtesy of Rebecca Burgess). A blood test to diagnose ASD has been nothing but a pipe dream…until now. Last month, the first blood test for autism was confirmed as highly accurate in a secondary trial. Blood tests for other diseases often test for a single marker, such as carcinoembryonic antigen for colon, lung, and liver cancer, or TRU-QUANT (CA27.29) for breast cancer. Efforts to identify a single metabolic marker for ASD has fallen short. So what was the reason for success in this new endeavor? Instead of exploring for a single metabolite that predicts ASD diagnosis, researchers from the Rensselaer Polytechnic Institute (RPI) utilized big data methods to find patterns in metabolites involved in metabolic pathways implicated in ASD physiology. Both pathways have been implicated in ASD physiology, and by using information on 24 metabolites instead of just one, the predictive algorithm had 88% accuracy rate when applied to a new data set. The RPI lab, led by Juergen Hahn, is not an autism-focused lab. Instead, the Hahn research group focuses on new techniques for systems engineering and analysis and the application of those analyses to biochemical systems – like the methionine and transsulfuration pathways for ASD. Unlike behavioral symptoms that do not emerge until later in development, a blood test can be administered at younger ages allowing for earlier diagnosis and intervention. Will the algorithm be validated in additional data sets? Are the metabolites readily measured in ASD diagnostic settings? Does the algorithm perform similarly across the autism spectrum? Will this test change the face of ASD diagnosis and treatment – what do you think? Note: This article refers to the autism spectrum as “Autism Spectrum Disorder (ASD)” parallel with current research areas. However, many involved in autism spectrum advocacy and collaboration argue to drop the term “disorder” as well as labels such as “high functioning” and “low functioning”. You can learn more here from the Art of Autism. Peer edited by Rachel Haake. Autism, or autism spectrum disorder (ASD), is a developmental disease characterized by various problematic behaviors. Children diagnosed with autism demonstrate language impairments, restricted interests, repetitive behaviors, difficulties in engaging in social interactions, mood and sleep disturbances, and many other behavioral issues. Because it depends on multiple genes and various environmental factors, ASD is difficult to diagnose and predict. Due to the lack of conclusive biomarkers for this disease, current clinical diagnostic standards are mostly based on behavioral tests. This presents a dilemma, as autistic children sometimes obtain medical attention too late, when their eccentric behaviors become very conspicuous. Fortunately, ASD is not totally irreversible. It is shown that if autistic children receive behavioral intervention during the first few years of their life, their condition can be significantly improved. This is because during the first three or four years after birth, the developing brain is highly plastic, or changeable, which maximizes the influence of external factors on a child’s brain development. However, current methods are not good enough for reliable diagnosis of ASD earlier than age of two, which cuts down the treatment efficacy in most cases. Countless children have lost their opportunity to live a normal life because they were diagnosed too late for any effective treatment. About a month ago, a paper in Nature proposed a hopeful method to resolve this dilemma. Multiple research institutes collaborating through the Infant Brain Imaging Study (IBIS) network developed a method to accurately diagnose children at high risk for autism as early as one year old. The researchers first identified a link between autism and brain overgrowth during the first two years of childhood. Based on this finding, scientists took MRI scans of the newborn’s brain at 6 months of age, and again at 12 months of age. The scientists then compared the scans using a machine learning algorithm that they tested on over 300 infants, and gave predictive diagnoses for autism to the family. Compared to the behavioral tests currently used for clinical diagnosis of autism, this MRI-based method is less subjective and confers a very high predictive accuracy among children with a high risk of autism. It is a paradigm shift in the field of autism diagnosis. While this technology is still preliminary and requires more confirmation before being applied for clinical diagnosis, as the first of its kind, this MRI-based diagnostic tool represents a life-changing modality for the autistic children by allowing them to start behavior treatment earlier. Peer edited by Holly Schroeder.